Donald C. Tedhams, 93, of Bellevue passed away Saturday, March 30, 2019 at the Stein Hospice Care Center. He was born July 9, 1925 in Alma, MI the son of Lee and Caroline (Madar) Tedhams. 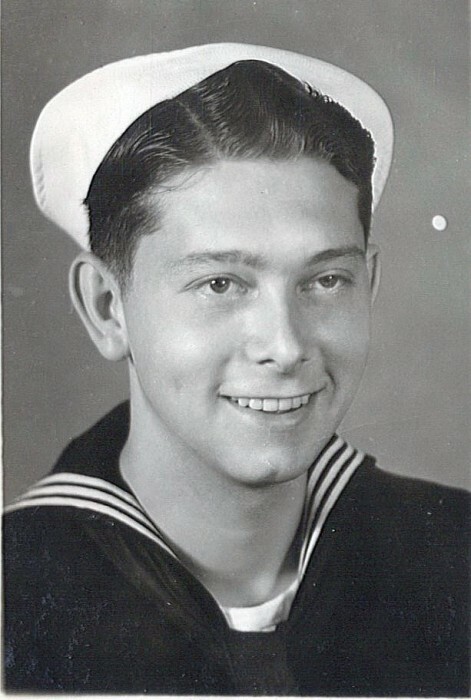 Don was a World War II Veteran serving in the United States Navy from 1942-1946. Don was employed by the Johnson Corporation and Maytag for 25 years as a Production Manager. After his retirement , Don became a public servant, serving as mayor of the City of Bellevue from 1983 – 1991. In 1991, he took on the role of Director of the Bellevue Area Chamber of Commerce a position he held until 2008. Don was a member of St. Paul’s Episcopal Church, Bellevue Elks Lodge 1013, Eagles Aerie 490, life member of the VFW Post 1238, and life member of the Albion, Michigan Masonic Lodge #14. He enjoyed gardening large gardens, and doing yard work. He is survived by his wife of 72 years, Marjorie (Hoyt) Tedhams, whom he married February 14 , 1947 in Alma, MI; Two sons, Randall (Sharon) Tedhams of Delaware, Ohio and Michael (Judy) Tedhams of Columbus, Ohio; One daughter, Terri (Dennis) Malott of Clyde; 6 grandchildren: Holly Lockard, Ryan Tedhams, Jenna Vasil, Kathryn Parks, Benjamin Malott, and Alexander Malott; 4 step grandchildren: Jeff Ryan, Jenny Williams, Mark Ryan, and Molly Chang; 16 great grandchildren; 2 step great grandchildren; 4 great-great grandchildren; and sister, Lucille Chovanec of St. Louis, MI. He is preceded in death by his parents, and brothers: Leslie Tedhams, Robert Tedhams, and Richard Tedhams. Friends will be received June 8, 2019 from 11 am until a memorial service begins at 1 pm, at Foos & Foos Funeral Service, 151 Yorkshire Place, Bellevue. Memorial donations can be made to Stein Hospice, 1200 Sycamore Line, Sandusky. There's still time to send flowers to the Calling Hours at the Foos & Foos Funeral Service from 11:00 AM to 1:00 PM on June 8, 2019.